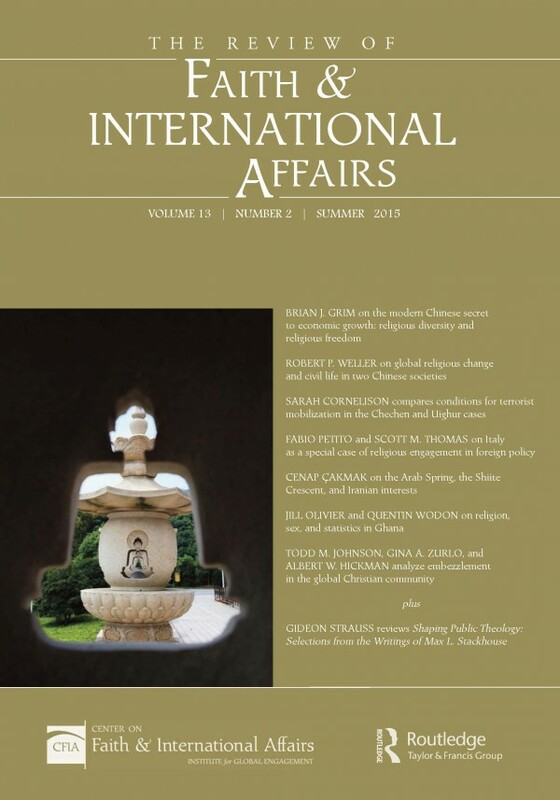 The summer 2015 issue of The Review of Faith & International Affairs features rigorous yet accessible research and analysis on several timely topics. Two articles—one by Brian Grim on links between religious diversity and economic growth in China, and one by Robert Weller on global religious change and civil life in Taiwan and Jiangsu—derive from a conference last fall co-sponsored by the journal and the Center for Faith & Inquiry at Gordon College. Other topics addressed in this issue include terrorist mobilization in the Chechen and Uighur cases (Sarah Cornelison), religious engagement and Italian foreign policy (Fabio Petito and Scott Thomas), the Arab Spring and the “Shiite Crescent” (Cenap Cakmak), religion and reproductive health in Ghana (Jill Olivier and Quentin Wodon), and embezzlement in the global Christian community (Todd Johnson et al).